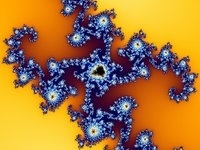 A journey into the recesses of M.
We have discussed the Mandelbrot set in depth but we have not yet displayed it. 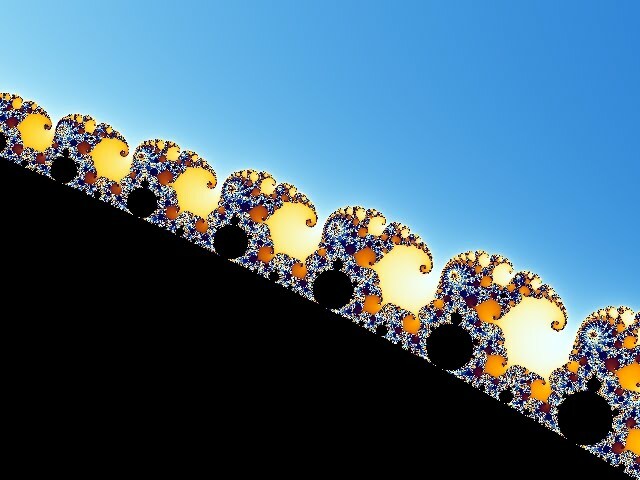 Here we visually present the striking parts of the Mandelbrot set. 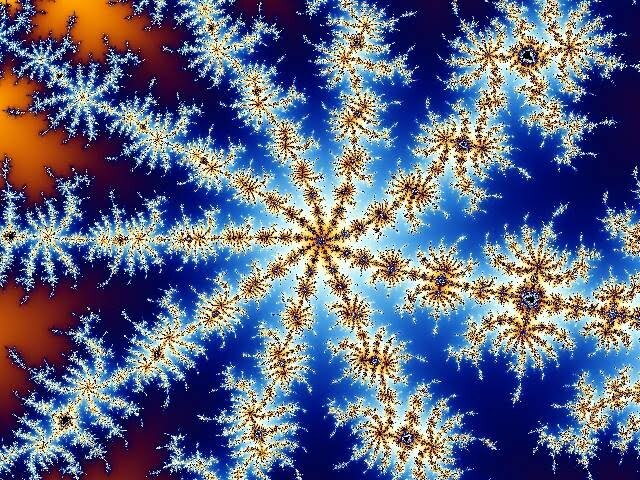 We begin with a view of the entire Mandelbrot set. This picture is centered on (-0.7, 0). 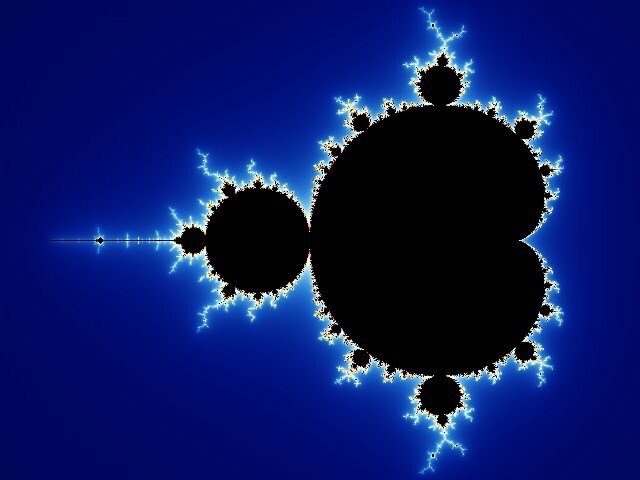 Notice that the intersection of the real numbers with the Mandelbrot set is [-2, 1/4]. Note that the elephant valley converges to the point z = 1/4. 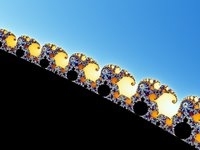 So the elephant valley is the area where the iterations required by 1/4 + ε to diverge multiplied by the square root of ε converges to π as demonstrated in the previous section. 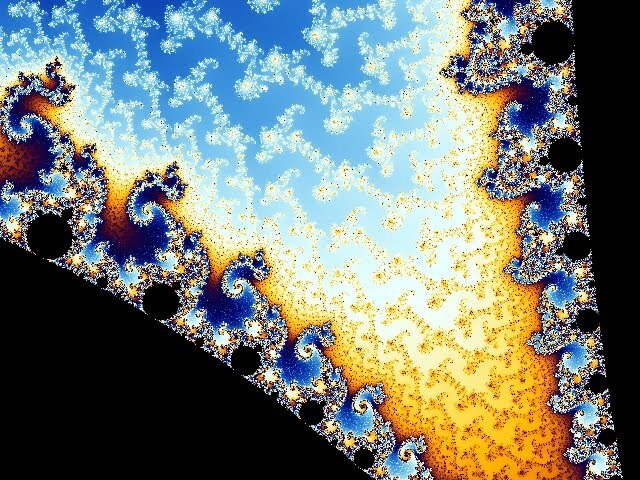 We shall now begin a deep journey into the "seahorse valley," just above z = -3/4, where seahorse-like features adorn the side adjacent to the main cardiod (the large heart-shaped section of the Mandelbrot set). Remark: z = -0.75 is the only point connecting the central cardiod with the bulb to its left. This implies the seahorse valley is infinitely thin. Another remark: The main cardiod features parameters c for which Gc has an attractive fixed point. The bulb to its left features c for which Gc has an attractive 2-cycle; the smaller bulb above the main cardiod features 3-cycles. The study of this "periodicity", called the rotation number, is known as "bulbs counting." 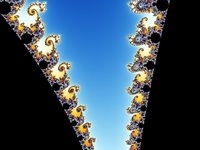 Continuing into the seahorse valley, we explore the tail of a seahorse. Then we delve into a "double hook" shaped feature to see a baby Mandelbrot set. Yes, that is a little Mandelbrot set! But are its features identical to the original? We shall find out. 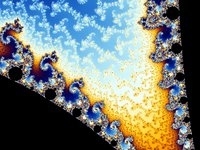 Here we explore the baby Mandelbrot set's own seahorse valley. 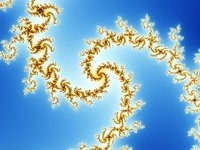 Notice that this seahorse valley is different from the original one. There are fractal "channels" flowing from one side to the other - the middle part of the seahorse valley now has a fractal pattern. 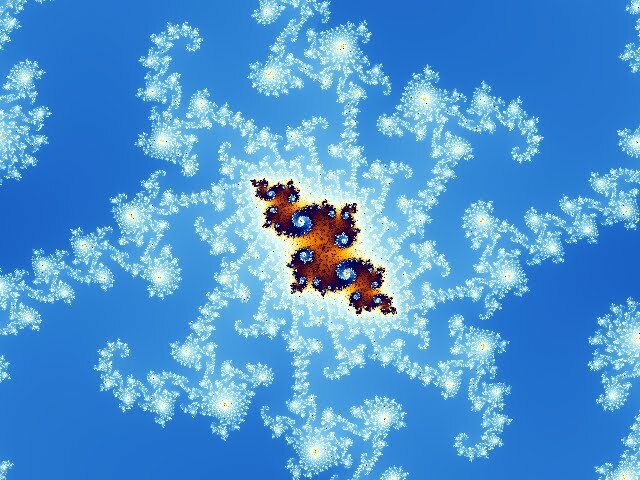 Zooming in further, we can see a Julia set. 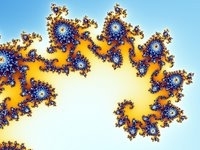 So the Mandelbrot set contains geometric features that resemble Julia sets. This concludes our exploration of the seahorse valley. 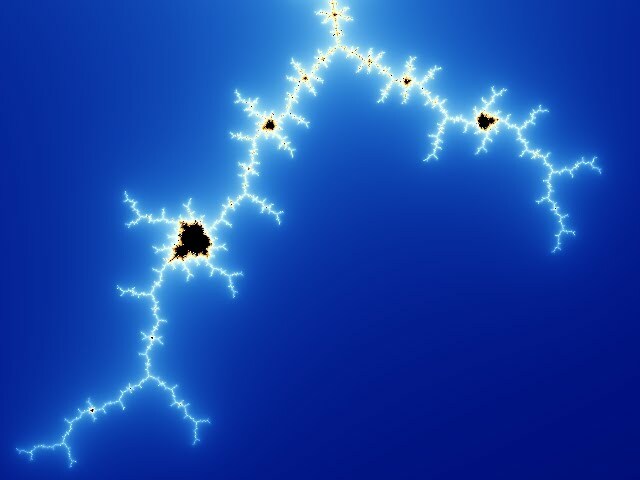 This is my favourite part of the Mandelbrot set, the lightning bolt above and below the "period-3" bulbs. We now present some other salient features of the Mandelbrot set. Below is the triple spiral feature, to the right of the 1/3 bulb (just on top of the main cardiod). Featured below is the scepter valley, which is left of the 1/2 bulb. And this concludes the visual exploration part of this website. 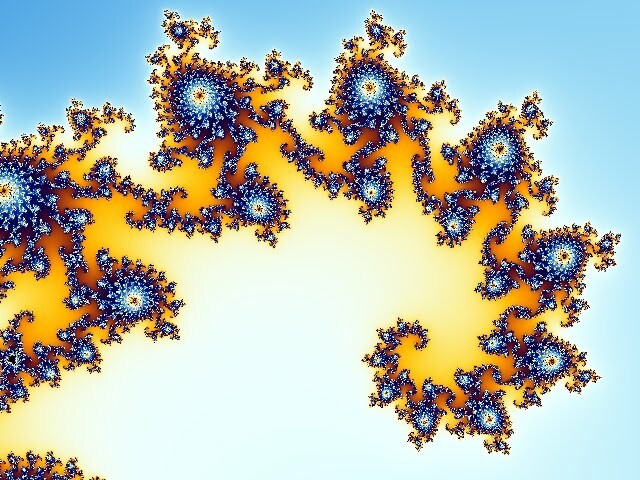 These vibrant images were produced by Ultra Fractal 3. 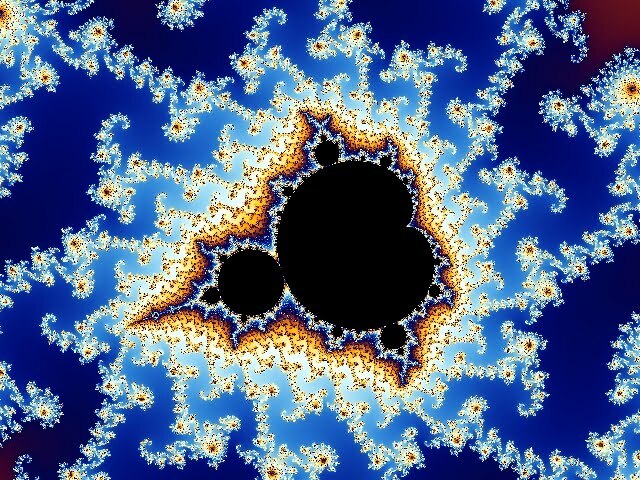 I chose this program to showcase the Mandelbrot set since my applet cannot produce pictures of this caliber. The gradient scheme is credited to Dr. Wolfgang Beyer. 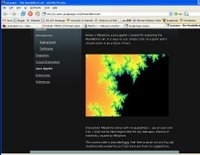 Here are some pics of M from my applet. If you click on the pictures you can get a better look at them. Clicking once on the 1/3 bulb above the main cardiod, we get this. If we zoom in many, many times, we find that it takes a long time to compute, and so a it takes a few seconds to render the screen. We see a white area still left to be computed here. And this concludes this section!